What is Formulyst Anti-Dark Circle Cream? Formulyst Anti-Dark Circle Cream is a product that claims it can reduce the severity of those pesky dark circles around your eyes. Whether you have always had trouble with dark circles, or you are noticing that they are developing around your eyes as you age, this is a product that may be able to help you out. It is a topical cream applied around the eyes that provides certain nourishment to the skin. What kind of nourishment? We are told on the official website that Formulyst Anti-Dark Circle Cream introduces added vitamins and amino acids to the skin around the eyes, energizing it and encouraging a healthy glow. Please note that this particular skin care product is one that contains both natural botanical extracts and synthesized compounds. Who is the Manufacturer of Formulyst Anti-Dark Circle Cream? This product, which bears the name of its creator, is made by Formulyst. Formulyst is a company that says they make their products with only ingredients that work, and without filler ingredients. They are based in New York City and also have a headquarters in the UK. Formulyst backs up their products with a solid return policy as they manufacture high-end beauty products for consumers with discerning tastes for natural alternatives. As far as Formulyst Anti-Dark Circle Cream goes, they claim it will make the skin around your eyes look brighter and more youthful. They tout it as a powerful anti-dark circle cream made from researched and effective ingredients. How Does Formulyst Anti-Dark Circle Cream Work? The main components of this anti aging eye cream seem to be caffeine, quinoa extract and butcher’s broom extract. This tandem of natural components enhance the appearance of the skin around your eyes and, according to Formulyst, will leave it feeling better to. The product is supposed to work by reducing puffiness and the visibility of dark circles around the eyes through topical application. Formulyst Anti-Dark Circle Cream Ingredients – Are They Safe & Effective? Formulyst Anti-Dark Circle Cream contains a number of ingredients that are common for skin care products of this nature but its the tandem of the three natural components that make it interesting. Take a look at the following list for more information. Butcher’s Broom Extract – This natural extract is used to prevent inflammation and reduce the appearances of certain skin blemishes. Caffeine – Caffeine has the ability to constrict the blood vessels under the skin to reduce puffiness. Chenopodium Quinoa Seed – The extract of this seed is used as a skin conditioning agent with little health hazards. Paraffinum Liquidum – A mineral oil that is highly refined to provide moisture to the skin. Polysorbate 60 – Typically used as a thickening agent and emulsifying aid in beauty products. Carnitine – Carnitine is the name for a combination of amino acids that is responsible for transporting long-chain fatty acids. What are the Advantages of Formulyst Anti-Dark Circle Cream? It is said that this cream goes on light and makes your skin feel good. This product may ultimately reduce the appearance of dark circles around the eyes. Formulyst Anti-Dark Circle Cream may provide your skin with important vitamins and minerals. This product may also smooth the skin around the eyes. What are the Disadvantages of Formulyst Anti-Dark Circle Cream? Butcher’s broom may cause hives or swelling of the skin. This is not an all natural beauty product. Shipping fees for this product are relatively pricey. We are not given specific application instructions for Formulyst Anti-Dark Circle Cream. How Should you Use Formulyst Anti-Dark Circle Cream? Unfortunately we are not told when or how often you should use Formulyst Anti-Dark Circle Cream. All we know is that it is a topical cream meant for the skin around the eyes. How Much Does Formulyst Anti-Dark Circle Cream Cost? 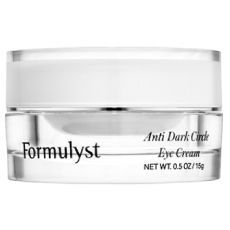 A single bottle of Formulyst Anti-Dark Circle Cream which contains half an ounce of the product costs $59.00 on the official website. What is Formulyst Anti-Dark Circle Cream’s Return Policy? If you are unsatisfied with Formulyst Anti-Dark Circle Cream you can return it for a refund minus the cost of shipping within 31 days of the day you bought it. Does Formulyst Anti-Dark Circle Cream Offer A Free Trial? There is no free trial offer for this product. We are always updating our reviews however, so check back with us and we will let you know if a free trial is made available. As a cream that is meant to benefit the skin around your eyes and make it look better Formulyst Anti-Dark Circle Cream may be able to reduce the visibility of dark circles. It is also claimed that Formulyst Anti-Dark Circle Cream will smooth out the skin around your eyes. This product may also reduce eye puffiness and can provide your skin with vitamins and minerals. Still, you should be aware that Formulyst Anti-Dark Circle Cream does contains butcher’s broom extract which may damage skin in certain ways. There are also no instructions for use given on the site. This is not a natural skin care cream and the cream may feel a bit heavy on the skin. We recommend taking a look at other skin creams before making your decision.